keeping gloves, scarves, woolly hats even small wellies! We think it makes great wine storage especially it you have somewhere cool and dark to keep it. The Apple Rack will store up to 36 full size wine bottles. This traditional style Scandinavian Red Pine Apple Rack was originally devised to store orchard fruit for use through the winter and was kept in a cool garden shed or cellar. 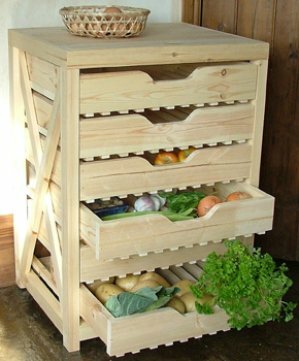 Each of the 6 drawers of the Apple Rack has a slatted bottom to allow air flow. External dimensions are 58cm across the front, 46cm front to back and it is 80cm high. Internal dimensions of each drawer are 47cm wide x 38cm deep and the front elevation is 8cm. One of the most common mistakes when storing tomatoes is to put them in a refrigerator. Storing tomatoes in refrigerator does not keep them fresher for longer, the opposite is true. They lose flavour and become mushy. There are far better ways of storing fresh tomatoes in order to keep them tasting fresh and sweet while maintaining their firm texture. The best place to get your tomatoes is from your own kitchen garden, raised bed or raised planter. When you growing your own tomatoes prepare them properly for storage. teaspoons of salt. After leaving them to soak for about twenty minutes remove them one by one and dry carefully with a cloth. Then place them in a bowl, or Apple rack lined with kitchen towel with the tomato stems at the top. If you place the tomato with the stem at the top they will stay fresher longer. The most tender part of the tomato is around the stem, making this the most likely part to be bruised. If your tomatoes are shop bought you should remove them from their packaging as soon as possible. Leaving them in polythene bags will cause them to rot a lot quicker.